A month after the rollout of California’s massive effort to issue driver’s licenses to 1.5 million undocumented immigrants, the process is working overall in Los Angeles and the Inland Empire. Still, many applicants report a mixed bag of experiences. Local advocacy groups are scrambling to address overflowing driver’s license preparation classes. Some test-takers are showing up at the Department of Motor Vehicles without studying, and some tech-phobes fear the touch-screen test format that allows four minutes for each question. Language kinks were being untangled last week for Mixteco speakers after confusion over whether translators could assist during the written and driving exam. The Legislature allocated $141 million to the DMV for implementation of AB 60, which took effect at the beginning of the year. Demand for the licenses has been high, with applicants filling offices from Culver City to the IE. In the San Fernando Valley, a new DMV office opened in Granada Hills to accommodate the flood of applicants. Each week the DMV updates statistics on driver’s licenses issued, the number of people applying under the new law, and the number of people who have taken the written and behind-the-wheel exams. A month into the process, the DMV has issued 39,000 licenses. “We’re in week four. 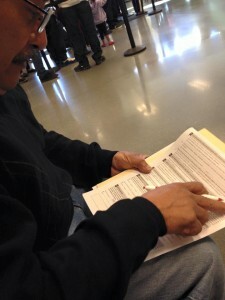 I think it’s going to take a month or two to find out best practices,” said DMV spokeswoman Jessica Gonzalez.